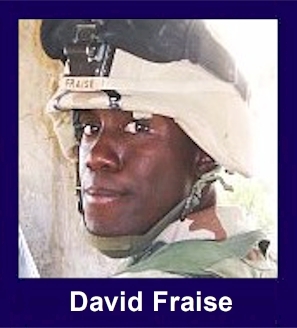 The 35th Infantry Regiment Association salutes our fallen brother, CPL David M. Fraise, who died in the service of his country on June 7th, 2004 in Deh Rawod, Afghanistan. The cause of death was listed as Small Arms/AW. At the time of his death David was 24 years of age. He was from New Orleans, Louisiana. Corporal David M. Fraise was born in New Orleans, Louisiana on May 1, 1980. In May 1999, he graduated from John F. Kennedy SR High School where he was active in the choir of which he enjoyed tremendously. This is where he met his sweet heart and soon to be wife, Niecy. CPL Fraise enlisted in the US Army on June 25, 2001. Upon graduation from Basic and Infantry Advanced Training at Fort Benning, GA, CPL Fraise was assigned to 2nd Battalion, 35th Infantry "Cacti", Schofield Barracks, HI A Company, 2nd platoon, 2nd squad. While in A Co, CPL Fraise served as a rifleman, SAW gunner, RTO, Javelin gunner, grenadier, driver and rifle team leader. In addition, CPL Fraise served in HHC 2-35 Infantry for one year in the S-3 section as the S-3 SGM / BN XO driver, RTO and company training calendar administrator. His contributions to the "Cacti" battalion were immeasurable, and his service to Soldiers and mission accomplishment was unparallel. CPL Fraise was always willing to support battalion activities even during his free time and was a moral compass to the soldiers so much that he wanted to change his MOS to being a Chaplains Assistant. While assigned 2-35 IN he participated in deployments to Japan, PTA, Makua Valley and two NTC rotations. His Awards and decorations include the Bronze Star, Purple Heart, Combat Infantrym Badge, Army Achievement Medal, Good Conduct Medal, National Defense Service Medal, Global War on Terrorism Expeditionary Medal, Global War on Terrorism Service Medal, Army Service Ribbon, Overseas Service Ribbon and Combat Infantrymans Badge. CPL David Fraise was a leader, warrior, and friend to all who knew him. He is survived by his wife Jen-Niece, 6 month old daughter Jireh and his mother Juanita Fraise.